So the time has come to say goodbye to 2017 and open the doors for 2018, the year of the faithful dog. Around us is fuss, in the shops of the queue, people choose gifts for their loved ones and relatives, for friends and acquaintances. All run home to cook more yummy snacks for the holiday table. And someone in the daily bustle still did not have time to dress up the Christmas tree. In general, the new year is in the air, around us, everywhere. But for the people of South Korea and most of Southeast Asia, such fuss is not entirely peculiar. Because in this part of our planet, the New Year is celebrated according to the lunar calendar, and therefore this magic day changes slightly every year, but usually it is the end of January or the beginning of February. Although, on January 1, officially the whole country is also resting. I would say that even December 25th (Christmas on the Catholic calendar) is more important in Korea than December 31st. This year, or rather already in 2018, the New Year in the east will come on February 16. In South Korea, it is called Sollal . And it is usually celebrated about 3 days. And these days the doors of many shops and cafes are closed. Although the main day, of course, is the day of Sollal himself. Koreans spend Sollal in the family. And according to good old traditions, they go to their elder relatives, grandparents to make a bow, or so-called sebe , to pay respect to the older generation. For this, the minor payload gets sebeton , i.e. a little money. Also, for each bow made, the older generation tells the younger New Year wishes. New Year wishes, as they say, they are in Africa wishes. So nothing special, they do not differ from other countries. All wish each other happiness, health, good luck, success in work and study and much more. I would like to note that sebe is made in national Korean costumes - hanboks . Hanbok on Sollal is called Solb . By tradition, every year it should be a new solbim, but a real Korean suit is not very cheap. And in everyday life, Koreans do not wear hanbok, only for certain holidays. I remember, in my university years, my friends waited for Sollal precisely because of sebeton ... These are the “poor students”. You are probably wondering: What is the difference between the spell and sebe? It seems like both rites are ancestral worship. In fact, the chare is the worship of the deceased ancestors, and the sebe is the New Year's bow to the living ancestors. Another important point in Sollal is a traditional dish, or rather a small rice loaf - ttok , which is made from rice flour and can be of very different shape and taste. 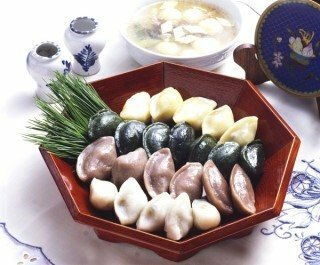 Also, Koreans prepare soup tokkuk , the main component of which is also tok. But in Tochkuk it is a slightly different kind of current, it is in the form of oval plates. Ttokkuk is usually eaten in the morning, on the day of the holiday. And it is believed that a person who has eaten tokkuk, is a year older. In general, in Korea, it is customary to eat a current or a toast or other dishes with a current, on the day of the exam. You probably ask, Why? Ttok itself has a slightly sticky consistency and therefore, it is believed that if you eat it before the exam and before the interview, then everything will be fine. They even say: “You will surely stick” (literal translation). By the way, Koreans and in everyday life they drink more water than tea. Even the amount of consumed coffee is much more than tea. In South Korea, there are even games that are played on Sollal. Although now not every house has this game. The board game is called Yut or Yunnori . The rules of the game are very easy, therefore, in order to play it, it is not necessary to speak Korean. The game requires 4 special sticks, the so-called Yut . All 4 sticks are thrown into the air, and then they see which side they fell. And consider how many steps a player or team moves forward on the playing field. And the winner is the team that first reaches the finish line. Yes, Yut is something like our dusks. What do Koreans donate to each other on Sollal? First, in Korea it is very fashionable to give gift certificates for a certain amount. These certificates can be spent in certain supermarkets and stores. Here, in short, as Sollal celebrates in South Korea.